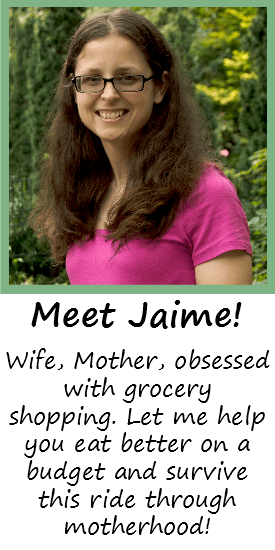 Thriving on this ride of motherhood and frugal living! This post may contain affiliate links. Please refer to my disclosure policy for more information. Are you low on funds this week? Read this list of 5 dollar dinners to give you ideas for cheap meals! Whether you’re struggling to make ends meet or just looking to save some money, I think we all need ideas for cheap dinners. Ways to stretch our grocery budget every week. Back when we ate for $37 a week, I felt like the master of coming up with cheap meals! 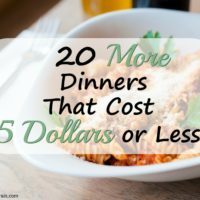 I’ve come up with a list of 20 dinners you can make for $5.00 or less, almost all of which are kid friendly! Keep in mind that some of these may not fit in with your lifestyle; that is, they may not be the healthiest option for your family. There are always healthier options, but when you’re low on money, you do what you can with what you have! These are also all main dishes, which means you can add any vegetable you may have in your house for a more well-rounded dinner. The prices I’ve come up with below are based on what I’ve found at Aldi; your store’s prices may vary. I’ve also tried to stay true to the actual cost. Some recipes elsewhere may say they only cost $5.00, but don’t take into account that you pay $2.00 for cheese but only use about $.50 worth for the recipe. I’ve tried to make sure each recipe stays around $5.00 even after buying more than what you need. Look at it this way: you now have leftover food to create another meal! Another great way to save money. So what sounds good for dinner next week? $2.50/box. We like cooking these with our griddle because we can fit 6 at a time! BBQ pulled chicken- easily made in our slow cooker and shredded using our KitchenAid mixer! Bag of rice: $1.79- We cook rice in our rice cooker to save time and energy! Brown ground turkey as the macaroni boils. Add macaroni to the turkey, as well as the cheese powder, diced tomatoes, and taco seasoning, and simmer for about 10 minutes. English muffin pizzas- Can be easily made in a toaster oven for a quick meal! Would you add anything to this list? Share recipes with us below! Like this post? 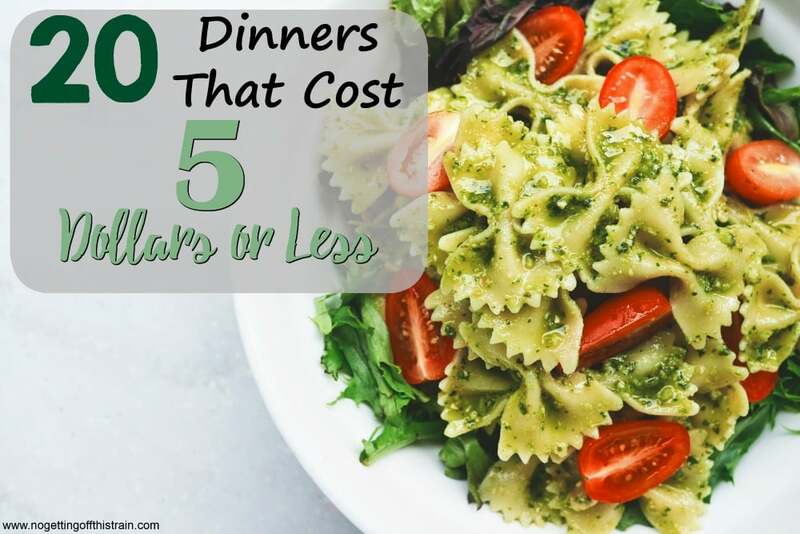 Be sure to check out 20 MORE dinners that cost 5 dollars or less! The Quesedillas are confusing. I am sure you put in something besides cheese. I love your site/blog! Thanks Barbara! As for the quesadillas, I think it just depends on the night. Sometimes we’ll get “fancy” and add chicken, rice, and/or black beans. A lot of times we’ll have just plain cheese (Just the way my daughter likes it!) and have Spanish rice as a side. =) Now that I’m looking at the prices I wrote down, I just realized I can add a can of black beans and still make it under $5.00, so I’ll add that now! Thanks for your help! For a struggling college student, I LOVE THIS LIST. I live in Ohio! =) My local Sam’s Club has them for $1.88/pound, and they’re usually between $1.99 and $2.49 a pound elsewhere. I have paid as little as 99 cents a pound for them. Just have to find the sales and stock up. Our Wal-Mart has chicken for $1.99/lb As their regular price. If you get markdowns you can get it for about $1.59/lb. Our local Aldi has it for $1.89 as their regular price but has it for $1.49 pretty often. I do have to say I like Wal-Mart’s chicken better though. I always get chicken breast for 1.99 a lb! my problem is we have 5 people in my house and i think she only has 3. My cost is almost double her amount. You’re right, we only have 3 people in our household. =) I still try to stretch what we have, though. A great way to stretch chicken is to either shred it or chop it finely and add it to things like casseroles. You’re still getting your protein, but you’re just making the chicken go further! Thank you for reading! =) I agree, with the holidays coming up, I’m trying to fit all baking stuff into my grocery budget as well, and it’s so difficult! They make cheesy taco seasoning??? 😮 I need this in my life, thanks for the suggestion! Sautéed frozen veggies in a little oil in a 10″ skillet or cast iron pan until soft if using frozen or 2-3 minutes on med-high heat with a little salt and pepper. Stir in drained tuna or chicken and cream of chicken soup (you can add 1-2 tablespoons of milk to thin out and make creamy if you want). Bring to a little boil and then Reduce heat to a simmer. Mix corn bread batter according to directions and preheat oven to box directions. You can omit liquid and add creamed corn if you choose that option – If batter is too thick, add milk or water to add more liquid. Pour batter directly over soup mixture and spread evenly. Put in oven and bake according to box directions for muffins. Hola! Chicken/Tuna Pot Pie! Wow, that sounds amazing! =) Thanks for the recipe, I’m going to try this! Breakfast for dinner is always a cheap go to in my house! Whether it be biscuits and gravy or waffles and bacon or sausage! Ah yes! Waffles with bacon or sausage! Love it! Costco rotisserie chickens are huge, delicious and $4.99 each. This is one where you’re obviously going to spend more than $5 if you want more than chicken but there’s so much you can do with the mountain of meat from these things that they’re worth considering. We like to make chicken shepherd’s pie using leftover mashed potatoes, frozen peas and chicken gravy. We also have cold chicken sandwiches, hot open sandwiches with gray and mashed potatoes, chicken salad, make stock from the carcass to have soup, etc. One chicken turns into several meals. That’s a great idea! =) It does initially cost more than $5.00, but if you divide it up, I’m sure the recipes will cost much less! We have a Sam’s Club membership, so I may check out those instead of the chicken breasts we usually buy. If you are from the US the 99 cents store is amazing! my aunt Nancy makes these amazing nachos. we call them Nancy nachos. bag of torilla chips can of refried beans American cheese. That sounds awesome and very frugal! Thanks for sharing that! Spinach mushroom and feta frittata comes in under $5! That sounds great, thanks for sharing! I had the onion and noodles, but everything else came in around $4 at the store. My husband LOVED it. Wow, I love some of these ideas and I am always looking for ways to use leftovers when we have them. I also love breakfast for dinner and when I have spaghetti I never seem to know how much to cook and usually end up with a bunch left over so I put it in a bag and a couple of nights later we have leftover spaghetti in a 9×13 inch pan, browned hamburger meat, mozarella cheese, and then spaghetti sauce on top with a little more mozarella cheese on top. Cook at 350 for 30 minutes and supper! Makes a cheap meal and the meat can be left out if you don’t have it or don’t want it. My favorite “instant soup” is a handful of vegetables in a bowl and I pour over it some organic bone broth. It cost me about $1-2 dollars at the most! I buy a large bag of organic frozen vegetables at Costco on someone else’s account. They are VERY big and chunky. Because it’s a large bag they last me a long time. I used to make my own bone broth but it’s expensive and extremely messy. Now I just buy the carton of the organic bone broth from my supermarket on sale and stock up. A pound of chicken isn’t $1.99 sweetheart❤ good try though! It depends on where you live! =) $1.99 is actually higher than I’d pay now where I live (Ohio). I’ve seen them go as low as $1.47 a pound. ShopRite supermarket chain has chicken breast for $1.99 a pound. That is the regular price. The problem is sometimes it’s not safe to eat and other times it’s fantastic. I live in Ohio, too, and chicken breast is $1.99 at several places around here (Toledo). If you get chicken quarters you can get a 10lb bag for like $6. I can get if for less at several stores. Shop frugal. Hannah quit making a fool of yourself! “good try though” ? Seriously? Of course prices vary depending on which state your are in! You don’t expect the same gas prices in every state, do you? Same goes for food! Go try to buy chicken in Hawaii for $1.99 and they’ll think you are insane, but other places that may be high in price! I used to think I was pretty good with $1.59 milk until I saw it was $.99 in other places. =) It’s pretty cool seeing the price differences in other states! What?? Omg! I’m in FL and haven’t paid less that $3.00 for milk in years. I was in New Smyrna Beach, so I don’t know how that compares to other parts of Florida. =) I just know that I was totally surprised! I get organic 2% for less than $3. One of our favorite cheap dinners, is chili mac. 1 box of macaroni and cheese, made as directed, and 1 can of chili (with or without beans, your choice) heated and mixed in. If we want to get expensive, we add in some cut up hot dogs. I make it with cut up chicken nuggets in it (or patties or anything that’s on sale really) it’s sooo good! This list is exactly what I’v been looking for! We have tried to eat clean but really need to cut back our budget. I feel like if the rest of our day is balanced and we add veggies (and this is what we can afford) then its great. Funny how sometimes you just can’t figure out what other people must eat to save money. This is perfect! Thanks, Megan! And you’re not alone; I feel like every week I’m searching for recipes like “Wait, what is food and how do I cook?” Sometimes you just need something to look at first! This is the most authentic list of meals you can eat when you only have $5 to spend and that’s it! All the other blogs I’ve seen, in order to get to the $5 meal, you have to spend way more than that! Thank you for “keepin’ it real” and giving us a list we five-ers can work with! I referred to your list last evening, when I only wanted to spend $5, and a pizza was listed. It just so happened that Acme’s store brand pizza was on sale for on $3.34 per pizza. Were it not for your list I would not have even considered a whole pizza as a $5 option. Thank you! Thank you! Thank you! Finally a blog that gets what “budget” meals means. I don’t have $200 to fill my pantry with bulk spices and such, I need cheap meals to make NOW. THANK YOU SO MUCH. And thanks to all the commenters, too! Thanks, Crystal! =) I try to keep a good supply of pantry items, but there are definitely weeks where you have just enough money to buy what you need right now! Thanks so much for these great (frugal) dinner ideas!!! I’ve got $10 in my wallet and was out of ideas! You are heaven sent girly! Thanks for real food meal ideas not all those fancy meals that I always see. I have my list of usual meals but wanted something different, easy and cheap. My easy fix meal is with my 6 quart/crocketpot, 5/6 chicken breast and salas. 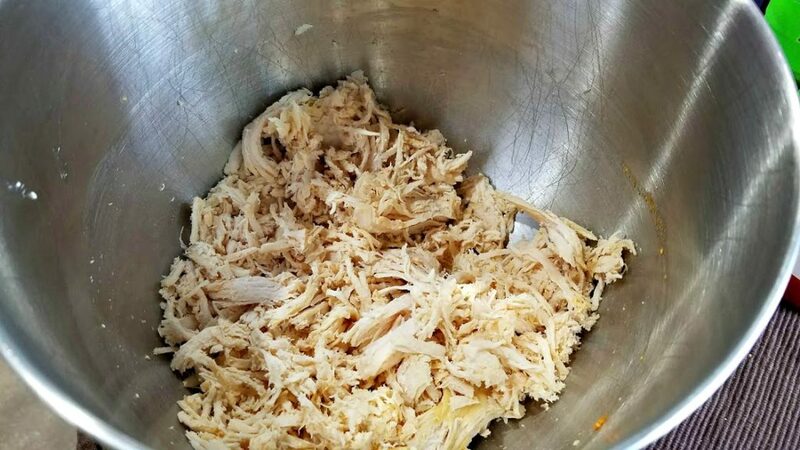 Put a approximately a cup of salas in bottom of crocketpot then add your raw chicken (I used frozen or fresh chicken with no problems). Pour about 1 to 1 1/2 cups of salas over chicken. Set your crocketpot – Hi for 3 to 4 hours or Low for 6 to 8 hours. I serve the chicken and salas mixture over white or brown rice and with a vegetable. Depending on the size of your crocketpot will determine how many pieces of chicken you are cooking. Ooh, Salsa Chicken is one of my favorites! And so easy, too! I love your blog! There are so many great ideas on here! Thank you, Ashley! I really appreciate that! These are great ideas! Cutting back on meats is so helpful! Cook ramen noodles. When they are ready use a fork to stir in a beaten egg, a splash of soy sauce and some spinach. Depression Spaghetti, a family favorite. Spaghetti noodles, butter, parm cheese, packaged bacon bits. About $5/pot exactly, depending on where you shop, and can feed a lot of ppl. I’m more from the south but a yummy quick cheap meal we make is open face sandwiches. It may cost a little over $5 for everything. We use loaf bread , sliced cheese, one onion , one tomatoe and a can of spam . All I do is cut everything up put 2 slices of spam , tomatoe, onion and cheese and put it in the oven and my kids love them !! Spam is such a great comfort food! I haven’t had it in forever, but I used to love the spicy Spam mixed with mac and cheese. =) Delicious! I just quite my second job and while I know I don’t need it anymore (all the hospital bills are paid off!) I’m in panic mode that I’ve lost $500 on month in income So I have been searching for cheap meal options. Thank you so much for this list. Several of the other ‘budget’ menus I found I leave the website wondering if they know what a budget is. Several of these ideas are going into this months menu. I use a few others but they run a few dollars more to feed usually 3 people sometimes 4. Mac & cheese or instant mashed potatoes usually no more than 1$ worth. Same as above but with 5$ worth pork chops. Burgers and fries if u find beef cheap enough. Excellent ideas, thanks for sharing! 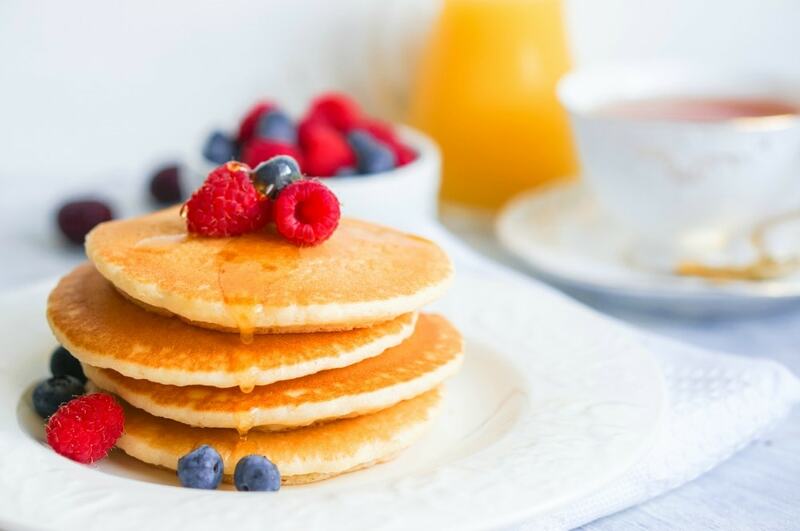 Breakfast for dinner is super cheap and can feed a ton of people.